Do You Want: Thoroughbred horse racing systems that work? Do You Want: A horse racing book specifically written for racing enthusiasts and professional handicappers alike? Do You Want: A winning system specifically created for each type of horse race that is currently being run in the thoroughbred racing world? This book was written as a tactical approach for winning at the races. This invaluable information combines both horse race betting strategies and winning percentages with proven winning results for each type of thoroughbred horse race. These systems and methods were created for people who are serious about making money. This simple reading material was developed to consistently achieve winning results. 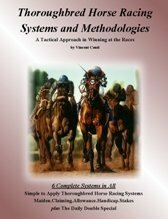 Imagine a book written in simple to understand racing terminology that gives you top win percentage horse racing systems! Simple to use and easy to apply, my book delivers six of the most powerful wealth-oriented horse racing systems. Each system has been researched and tested and covers all of the different race classifications along with different tactics. As a handicapper and horse enthusiast I wanted to create a way to win at the race track. I recommend you visit my Free horse racing system, actually there are two free systems posted on this website for your handicapping pleasure. has recently been submitted for you to review, apply and profit from by using this simple "spot play" that works. First of all, let me start off by saying "I love horses" and "I love playing the horses." Going to the racetrack twenty five years ago and going to the racetrack tomorrow continues to get me excited like a child in a candy store. Horse racing will always be a part of my life because it is not only exciting but the thrill of picking a winner and hitting an exacta, trifecta or superfecta makes me feel like I am on top of the world. Horse players, like yourself, have an uncontrollable urge to boast after winning a race. "I Got it!" or "I had that horse to win!" and "I got the triple" are just some of things I might blurt out after an exciting finish. Whether I'm at the race track or at the horse parlor it always seems like the other horse players are playing against each other and are actually competing against one another and not against the actual race itself. Handicappers arguing with each other about their picks before and after a race seems to be a common practice around here in the New York horse parlors. I don't know why this happens, but it seems handicappers try to outdo each other when betting on their own strategy... or they are simply looking for bragging rights. Either way, this is not the winning approach. It's you against the horses. It's you, the handicapper, trying to figure out the winner of a race and properly wagering on that race for your best return$. Do not get involved with competing against other handicappers. Your bragging rights will occur at the ticket cashing window. I developed my horse racing systems for several reasons and I think you will agree with some of my intentions. Probably the biggest reason is NOT to study a particular race for long periods of time. Do you find yourself looking at the performance statistics of a particular race so long you start contradicting your own handicapping methods? Or maybe over-analyze each of the match-ups in a particular race to the point of confusion? I was doing this from one race to the next race and eventually getting exhausted with statistical probabilities, mathematical dysfunction and plain old glary-eyed, mind boggling indecision making resulting in losing my money. Sure, there are races with tough competition making it difficult to find a winner, but there is no need to torture yourself with mind-grinding performance analysis. Take the Breeders' Cup for instance. Each race is loaded with highly skilled top percentage jockeys, trainers, and thoroughbreds racing together for huge purses. Track condition, odds, distance, beyer numbers, workouts etc. all add up to a statistical dilemma for the horse handicapper. With all of this being said I had come to the conclusion of creating a "system" that can abbreviate the length of time it takes to review any given horse race. If after reviewing a race, one of the horses "fits" the M.O. of a particular thoroughbred racing system then that's the horse I picked and that's the horse I would use in my wagering strategy. No more indecision. No more over-analysis. As an experienced handicapper I know what your going through. I know your frustrations and can relate to your handicapping dilemmas... we all go through it. Well, to be quite frank, I do NOT suffer like I used to when playing the ponies. I "knuckled down" my handicapping woes and with time on my side I created certain angles or systems that I now apply wholeheartedly every time I visit the race track or the parlors here in New York. These horse racing angles will definitely improve your knowledge and I am confident your handicapping skills will be greatly enhanced with what I have produced in my book. When I developed each of these systems it changed my whole way of approaching and handicapping a horse race. Each system takes only minutes to apply. There's no "study long, study wrong" approach when handicapping a race using my racing angles. There is no software, no subscriptions, and no gimmicks. Some simple mathematics here and there but basically down to earth horse racing angles that work! I recommend reviewing some the links below and read about some of the interesting betting strategies I have posted. Knowledge is power. Horse racing blog keeps you up to date with the latest winners of my thoroughbred horse racing systems.Subscribe here.